JPRC007 - 7-8mm Splashing Heishe color navy blue and green, available in different colors. JPRC008 - 7-8mm Splashing Heishe color blue and orange, available in different colors. JPRC009 - 4-5mm Hammer Shell color blue, available in different colors. JPRC010 - 4-5mm Hammer Shell color purple, available in different colors. JPRC011 - 7-8mm Splashing Heishe color back, available in different colors. 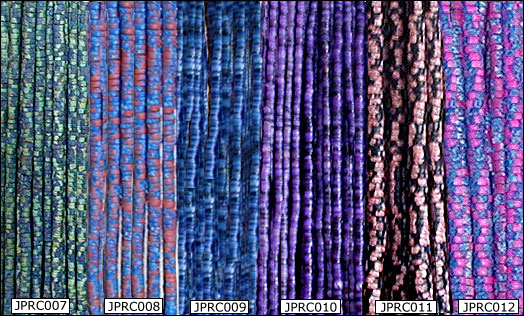 JPRC012 - 7-8mm Splashing Heishe color blue and pink, available in different colors.